Ensure the potatoes intended for storage are fully mature and have been cured or else they will not store well. The skins on mature potatoes will remain firmly attached to the tubers when rubbed. Before final storage cure potatoes at a temperature of 45-60 F (7-16) and high relative humidity (85 to 95 percent) for about two weeks. Final healing of minor cuts and bruises and thickening of the skin occurs during the curing process. It is very important that you remove any damaged potatoes caused by insects, slugs, wire worm, other pests or your garden fork. Potatoes should be firm, free of soft spots, and disease. Even if you have check your potatoes at harvest time, check again before they go into storage and on a regular basis during storage, rotten potatoes can quickly affect a large number of previously good spuds. Potatoes are best at 40 F (4 C) Humidity should be kept high (80- 90 percent). Although potatoes lose moisture through respiration, low humidity is the main cause of shriveling in storage. Under good storage conditions, potatoes will keep for up to six months. Even when storing potatoes under the best conditions, they will lose some quality the longer they are stored. If conditions are too light, and warm, potatoes tend to soften and begin sprouting, the light will also turn the potatoes green. For best results, store in a cool, dark place with good air circulation. Raw potatoes can not be frozen, if allowed to do so; they will be watery and inedible. If you have a root cellar for potato storage, heaping them in piles is a common method. It is important to store your potatoes in several small piles rather than in one large one. The bottom potatoes will get bruised and damaged by the weight of those on top. Large heaps of potatoes tend to heat when ventilation can't reach the center of the pile, lowering quality and shortening storage life. A garden shed that is watertight and can be kept dark is the perfect place for root vegetable storage. Partially heated garages, closets, porches, basement or back rooms are all excellent sites for storage as long as you can keep the area cool and protected from freezing. Whatever area you choose to store your potatoes there are several ways to contain them. Remember if heaping potatoes to make the pile small to avoid damage and maximize ventilation. 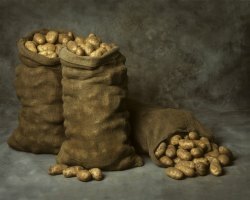 Bagging up is very convenient, potato sacks, either made of paper or of hessian, netted sacks, slotted crates or baskets can all be used for storing potatoes. Obviously if dampness is going to be a problem you will need to use pallets or such to keep the bag off the floor. Using shelving where containers can be stacked and still allow for good air circulation is as good. The best method will probably depending on your storage area. Do whatever it takes to keep the potatoes cool and dry but with enough humidity to keep them in good condition. It is best to keep potatoes and fruit stored separately where possible. Fruits give off ethylene gas, which promotes sprouting in potatoes. If it’s not practical to do so, then separate them as far apart as you possibly can and make sure the storage area has plenty of ventilation. When potatoes have been stored for some time the cold temperatures convert starch to sugar, giving potatoes a sweet taste. The sugar caramelizes during cooking producing brown potatoes and an off flavor. To help potatoes regain some of their starch and reduce this effect take the potatoes out of storage and keep them in the dark at room temperature for a couple of days before using them. If potatoes do start to sprout, they can be removed, and if the potato is still firm, are still good of cooking. Shriveled or wrinkled potatoes are not going to taste good. Where potatoes have been exposed to the light and are green, if severe greening has penetrates deep into the potato, these should be discarded. Light greening of the skin only, can be peeled away and the rest of the potato eaten.